Posted on Monday, February 11, 2019 by "T". The Sit & Go Jackpots game has been renamed to "SPINS", with players having the chance to win a sweet $1 million in a jiffy with only a buy-in of $5! partypoker is rejoicing their launch of SPINS and a great way to celebrate it is by offering a special edition of SPINS $1M games, giving players that rare chance to become a lucky millionaire in mere minutes for just a $5 buy-in! 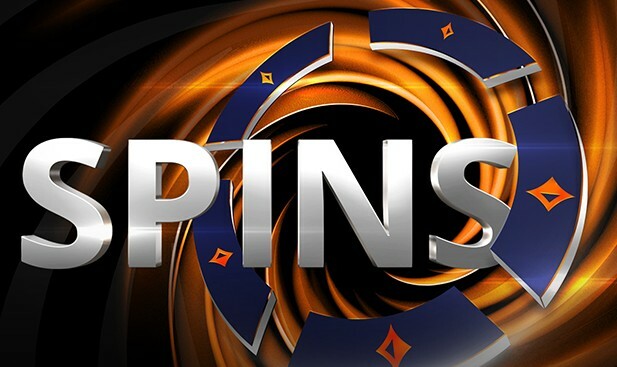 SPINS is the rebrand name of partypoker's highly popular three-handed Sit & Go Jackpot tournaments, a series of games in which players can take home big cash prizes for just a small buy-in amount. The all-new SPINS 1M edition features a random multiplier between 2 and 240,000, applied before a card is dealt to establish the eventual prize pool's amount. This means players can vie to win in a prize pool of up to 240,000 times larger than their buy-in. 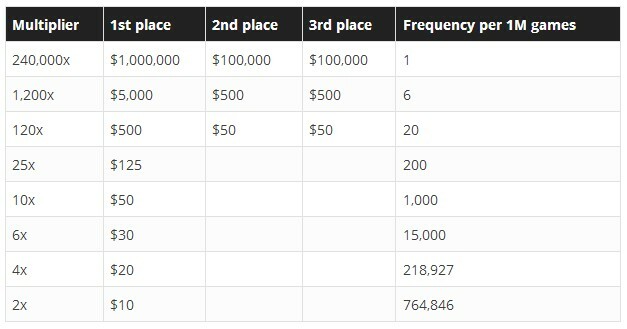 If the top tier multiplier is hit, players are in the running for the first prize worth $1M, whereas a $100,000 prize money will go to the second and third place winners each. Partypoker ambassador Sam Trickett said, "SPINS are quick, fun and easy to play - giving players of all levels the chance to turn a small buy-in into a life-changing amount of money. I can't wait to see who will become the first SPINS millionaire, from just $5!" 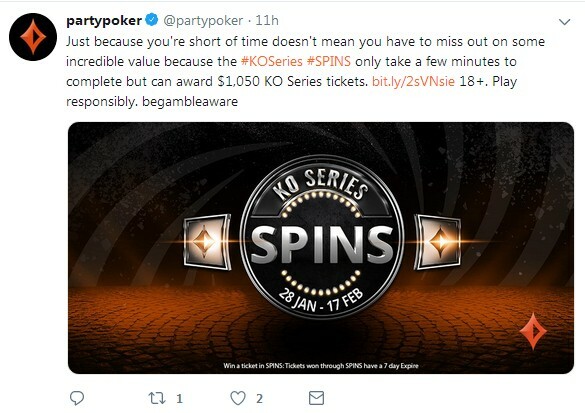 Players can find the game by clicking the SPINS tab right in the partypoker lobby, and they can still participate in the KO Series SPINS edition ongoing right now! Join partypoker now and get $8 FREE (no deposit required)! partypoker: The Omaha Series is coming! 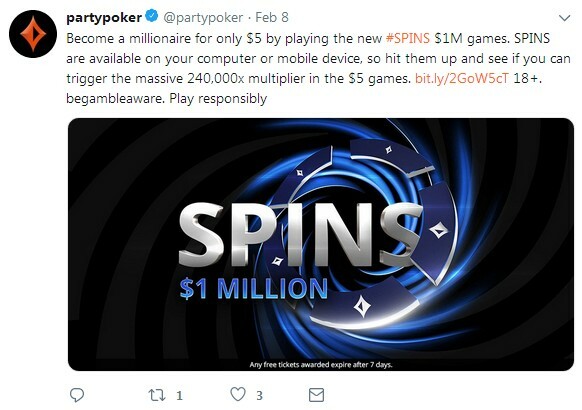 12 comments for "partypoker celebrates SPINS launch with $1M jackpot for only $5 buy-in"
This is a really good move from PartyPoker! If I only had enoug of a bankroll to play these games I would surely go for it! Just imagine winning $1 million for a buy-in of only $5! Talk about beinga life changing win. I'm gonna keep my eye on this to see when the first person winning the million dollars will appear. This is good news for the party poker players. I bet many will try their luck for the 1 million. But the winner gets a whole million, plus the other two players from 100k each. this is great promotion,especially for players who love to play spin games,so this is not lowest buy in,but still not so big amount for chance to win great prize!but as they say on this screen shot from twitter lay responsibly!this will make lot of players to play more and more! the fact alone that they need to rebrand this whole thing from the get-go tells me it did not produced the results they wanted in the first place, I am not exactly sure another promotion is the key here to make it right this time... but who am I to know, right? This celebration is beneficial for the three players who will win. One million dollars for 1st place and the other 2 players with 100 k is a very beautiful celebration. The big prize will change the life of this player with a amazing speed. Probably will be a big shock for him. I remember video from one russian player who got huge spin win,he couldnt believe and it was on poker stars!its good that he record everything,so you can find this video on you tube!ofcourse this is something that they will just give from buy ins,its not like that they give for free this amount,but good promotion! Yea i have seen a couple of such videos. In one the top prize is 300k and the other two are getting 25k each. No matter what place you finish there you are leaving with your pockets full. What are you talking about? Cant you see the list with the places and prizes. Three players are in. Second and third win 100k and the first one gets the million. I would love be in that game and finish in the last position ! when it comes to online poker you can not be surprised by the dynamics and what better cards can just hit you out of nowhere as for me I always seemed to get rivered when nearing the final stages in the tournament where the blinds are around 6/12k and once I've committed 80% of my stack on the turn. that sort of makes me wonder sometimes too if they knew what cards were going to pop out especially when they have nothing at all and go all in on the flop and get runner-runner straights or 2 pairs etc.